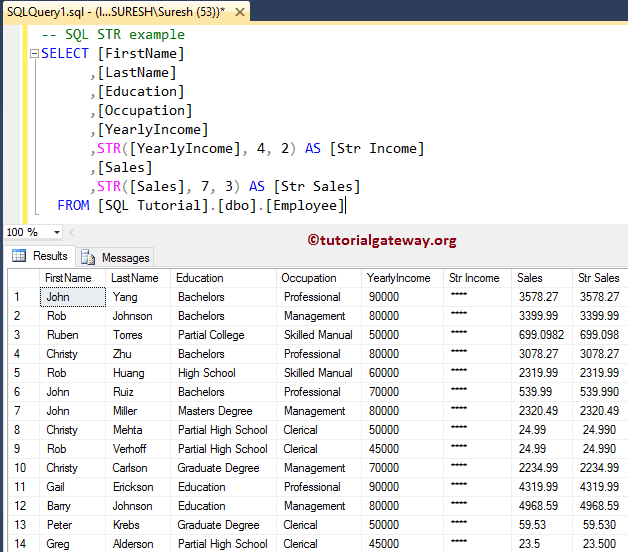 The SQL STR is one of the SQL String Function, which is used to return the string representation of the numeric expression. 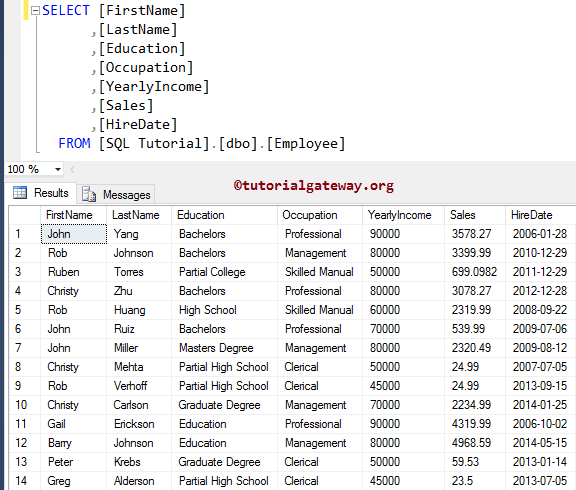 In this article we will show you, How to use/write STR in SQL Server with example. Float_Expression: Please specify the valid Expression for which you want to convert as character data. Pleas specify any expression of Float data type with decimal points. length: This is an option argument, and it represents the total string length. The value assigned to length argument includes decimal point, sign, spaces, and digits. If you omit this argument then SQL will assign default length as 10.
decimal: This is an option argument, and it represents the total number of decimal places to display by the string result. The value assigned to decimal argument must be less than or equal to 16, and if you assign more than 16 than the result will be truncated to 16. 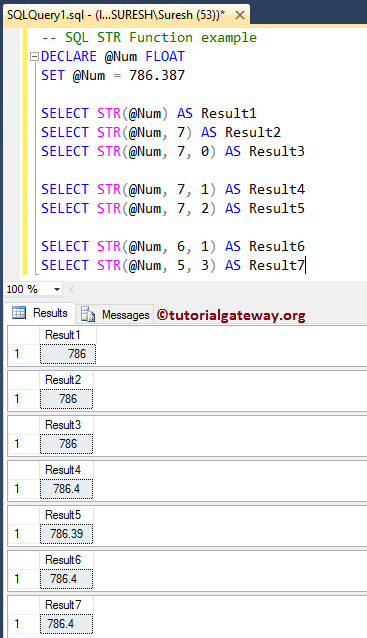 The Sql Server STR Function is used to return the string representation of the float values. The following query will show you multiple ways to use this function. -- Length = 7, No Decimal argument. -- Length = 5, Decimals = 3. 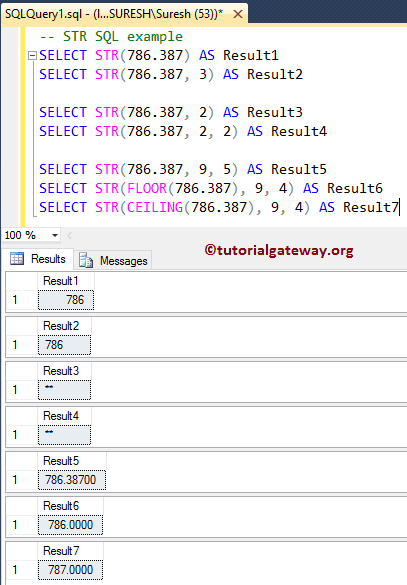 Within this SQL STR function example query, the below lines of code is used to declare one variables of FLOAT type. Next, we assigning the random value. For both the statements, Length = 7, and for the first one No Decimal argument, for the second statement decimal = 0. Although the length value is 7, @Num value will be rounded because decimal places defaults value is 0. We also assigned new names to the result as ‘Result2’, and ‘Result3’ using ALIAS Column. In this example, We are going to use the SQL STR function with uneven lengths and decimals values. Following statement will return the string representation of [Yearly Income] column and [Sales] column. From the below screenshot you can observe that, str Income is returning **** because we assigned the length value less than the yearly income value.